Pride & Prejudice, by Jane Austen. This is as good as any introduction to a novel and as good as any introduction to irony. The joy of irony is that the words mean something between what they literally say and the exact opposite. Their precise meaning is entirely up to the reader, which is perhaps why irony is so popular. “Mr Bennet made no answer” is possibly the funniest line in the whole of English literature. 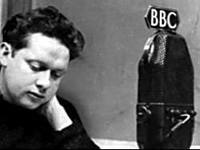 Fern Hill, by Dylan Thomas. Thomas has always been my favourite poet (although my English teacher at school once thought I meant Edward Thomas – ugh! ), and this has always been my favourite poem. Just be glad I don’t read it with a Welsh accent! Brideshead Revisited, by Evelyn Waugh. When a group of second years played the Brideshead theme out of the first-floor window in Peck Quad for our Christ Church matriculation photo, it was one of the most exhilarating moments of my life – even though they got fined for it! Under Milk Wood, by Dylan Thomas. Thomas again, this time the radio play that our family used to listen to on long car journeys on cassette, courtesy of Richard Burton. I tried and failed to direct the play at Oxford when I realised the difficulties with such a large cast, but it’s still a favourite. You won’t find a more atmospheric opening or more frequent use of the transposed epithet! This entry was posted in Audio, Fiction and tagged audio books, fiction on June 25, 2012 by Nick Dale.